HomeDo You Know Why Variable Speed is the Best Choice? Do You Know Why Variable Speed is the Best Choice? A single speed machine is cheaper per unit, but the overall value may not be cost effective at all! Essentially, the abrasive cutting and grinding processes are a function of physics. With abrasive cutting, more speed means more pressure and friction. And, in some cases, faster isn’t always better. You might choose the fastest tool thinking it will get your job done more quickly, but in most cases the opposite is true. PFERD understands the important relationship between rotational speed and efficiency. We have carefully designed our power tools based on understanding this relationship and the physics involved between the tool, the consumable, and the material. 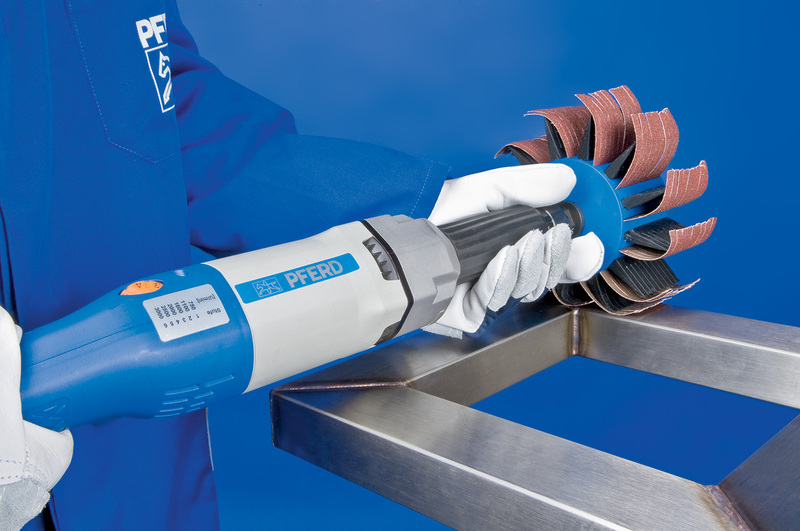 PFERD power tools, used in conjunction with the proper PFERD consumable provide a system that delivers an optimal process rather than just a machine. With the combination of a premium-quality consumable and a power tool designed to run at the proper speed and power output, the performance and effectiveness results in a much more cost-effective overall process for the user. As with all power tools it’s important to understand the difference between MSFS (“Maximum Safe Free Speed”, commonly expressed as “Max. RPM”) and recommended speed. With the exception of catalog 206, in which the MSFS and recommended speeds are identical , PFERD products are always listed with a recommended RPM in our TOOL MANUAL. A fixed-speed angle grinder typically runs at speeds between 9000-11000 RPM. For grinding and cutoff operations (4-1/2” dia. ), this is a perfectly acceptable speed range. However, if you then switch to secondary operation such as brushing or finishing with a coated or non-woven product, the speed of this grinder is typically too high for optimal performance. Running products at too high of a speed can cause many problems, such as excessive heat, which can lead to problems such as discoloration and warping of the workpiece, overgrinding of the workpiece, and even failure of the product itself. With coated and non-woven products, excessive speed causes glazing of the abrasive grain, and can actually melt the non-woven material rendering it useless and possibly damaging your workpiece. Most of these problems will result in costly reworking operations. With variable speed power tools, the user has the ability to change speeds to best match the application and provide optimal performance. With better control, time-consuming and expensive rework is eliminated leading to the best value for the end-user. ← How Safe is Your Workplace?